Jane Broccolo bares her soul and spirit to the reader in such a way that we can feel and understand her life experiences, and the reasons that she made the decisions she did and the paths she took to become the person she is today. We have always been fascinated by the way people think, and why they think and respond the way they do, which Like an Animal opens up for our understanding. And, like Jane, we recognize the fact that all animals, human or otherwise, are spiritual beings with souls and spirits. We all have the same feelings and emotions, which are obvious to anyone whose mind is open to perceive. Jane frees us from conventional thinking, and helps us feel safe to explore the glimpses we get into connecting spiritually with companion and other animals. While reading Like an Animal, we kept thinking about the way God's Spirit first touched us in early life, even though we didn't respond until later in life, the way Isaiah was open to the Holy Spirit to visualize the restoration of all creation back into the peaceable kingdom it was created to be, and the way Francis of Assisi communicated with both animals and the environment. 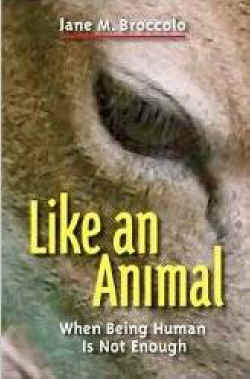 We hope you enjoy Like an Animal: When Being Human is Not Enough as much as we did. Jane Broccolo is an animal communicator, a Polarity Wellness Educator, a Reiki Master, a freelance writer on human-animal connections, and founder of Talks With Pets and Animal Self Empowerment™ (ASE). Visit her website Talks With Animals. She lives in Aptos, California with her canine companion, Sweetgrass.